Clutch hitting – real or myth? Dozens of players over the years have been on both sides of that designation. Reggie Jackson‘s World Series heroics for the New York Yankees in 1977 helped earn him the nickname “Mr. October.” Derek Jeter is another Yankee who is regarded by fans as being able to come up big in “clutch” situations. His teammate Alex Rodriguez, because of some celebrated post-season failures, has rarely (ever?) been regarded as being a clutch hitter. Most recently, Red Sox designated hitter David Ortiz (pictured) hit his first career grand slam in Game Two of the American League Championship Series against the Detroit Tigers. 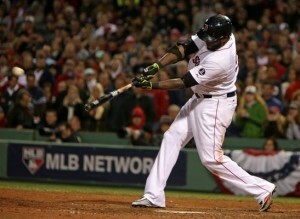 It came in the bottom of the eighth inning at Fenway Park in a game the Red Sox had been trailing 5-1. Perhaps inspired by the Ortiz blast, Boston went on to score the winning run in the bottom of the ninth inning to tie the series at a game apiece. But does such a thing as a “clutch hitter” really exist? Does in fact Derek Jeter really rise to the occasion when the game is on the line in the late innings? Did David Ortiz further cement his own reputation as the greatest clutch hitter in Red Sox history (at least according to principle owner John Henry) with that grand slam? A recent article in Sports Illustrated makes an interesting point – clutch hits certainly exist, but you might want to hold off on calling anyone a clutch hitter – even Derek Jeter. What do you think? What comes to your mind when you see Derek Jeter or Alex Rodriguez step into the batter’s box in the 8th inning of a tied game? Post your comment below.